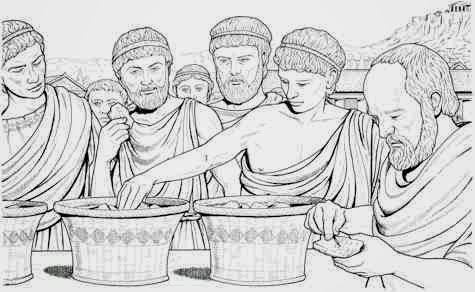 Voting Has Roots Going All The Way Back To Ancient Greece! Going back into the history of voting, the first voting method to be on record is the majority method, and it was most notably used in the Greek city-state of Athens, where men above the age of 18 went to a specific place called Pnyx hill and used pebbles and recording tablets to make their democratic decisions. I think this article is not only interesting because of it’s historical roots to voting and showing of just how old the idea of taking votes really is, but it also shows the importance of the majority method, especially in very democratic countries (I’m looking at you, U.S.). In the state of Maine, winners of elections were previously decided by plurality (where the person with the most votes wins). This year in 2018, voters of Maine decided that they wanted to use a ranked choice method of voting. This means that candidates must achieve a majority of the votes (51%) in order win. (Read more about ranked choice here). The primaries for Maine happened back in mid June, where candidates from each party were nominated for governor. This was the first state-wide election to ever use a ranked choice ballet in the country. Republicans of Maine, who won the last election by plurality, fear that this new method of voting hurts their chances of winning this election. In 2010, republicans only won they election by about two percent over the democratic nominee. In that election, there was a left-leaning independent who took a decent amount of votes away from democratic nominee. In a ranked choice election, there is only two candidates left for the final vote. People that voted for independent candidate originally, would more than likely swing there votes toward the democratic candidate which could of switched the election results entirely. Looking through the internet for this blog, I found some more information on something we briefly discussed in class. Jesse Ventura won the election for governor of Minnesota in 1998 with a plurality of 37 percent. The second and third place candidates received 35 and 28 percent of the vote respectively. However, according to exit polls indicated that almost everyone that voted for the second place candidate had the third place candidate as a second choice, and almost everyone that voted for the third place candidate had the second place candidate as their second choice. This example demonstrates how plurality voting violates the Independence of Irrelevant Alternative(IIA) Criterion. Had either the second or third place candidate not been in the race, it’s likely that third or second place candidate would have won, respectively. Yesterday I read a really interesting article in The New York Times called “Vote For Me! For Second Place, At least?” that was written in June. It was essentially about the Maine election where they planned on using a ranked-choice voting system instead of a plurality system. One thing that caught my eye, in particular, was that the instant runoff method had lead to more diverse candidates winning around the country. They had used one example of many cities in the Bay Area electing more diverse people to represent them. All of these cities had recently adopted ranked-choice voting, which was an interesting correlation. This was written in the Op-Ed section, so most of the article was opinion, but I definitely suggest taking a look at it if you’re interested! Also, what do you guys think about ranked-choice voting? Do you think it’s better than the current system used in the United States? I just want to briefly go over why I think the Copeland method is the best method (as opposed to Boarda, Plurality and Elimination/Runoff). As a recap, Copeland meets the most criteria of any method. The one who wins through the Copeland method is often going to be Condorcet, since the methods are similar. Majority is also a guarantee because when one wins through the Copeland method often has a majority as well. And if you are placed higher in the Copeland preference schedule then you’d just do better in it, so the monotonicity method is satisfied as well. The only problem with the Copeland method is the Independence of Irrelevant Alternatives (IIA) criterion. However, I don’t think this criterion is very important and in fact, I’d probably vote IIA as the least important criterion to meet. What should matter in a given preference schedule is who or what is actually in the schedule, not what would happen if some hypothetical candidate wasn’t there. So the fact that the Copeland method doesn’t meet this criterion isn’t very important. And in fact no method of the four previously mentioned does, so it’s not like you can do better besides Approval voting. Speaking of, I’m interested to see if anyone has any ideas about Approval Voting vs. Copeland. Trivia: Wikimedia, which is related to Wikipedia, uses the Copeland method, and we all know Wikipedia is one of the best things to happen to the Internet since memes.